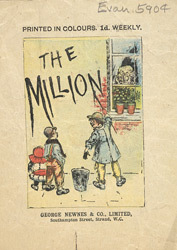 The title of the periodical featured in this leaflet, ‘The Million’, demonstrates how widespread periodicals were during the 19th century. There were many different periodicals and journals dealing with a variety of subjects from fashion and society magazines and art journals to professional and trade periodicals. It has been suggested by J. S. North, that the circulation figures of periodicals and newspapers during the 19th century, was even larger than that of printed books.